Even local vendors hired to drill a Jesus Well can be encouraged by the words of Jesus on the plaque they install. Tanul’s hands wielded his tools with a strength and grace that made it evident he knew his craft of masonry well. But for as much skill as he had, he couldn’t understand the meaning of the words on the plaque he was fixing. His eyes strayed to them often as he worked, the words running over in his mind. “Everyone who drinks this water will be thirsty again,” it read. This was the second Jesus Well that Tanul had worked on, a job given to him by local GFA-supported worker Divit. He and Divit talked often. After their first encounter, Tanul had come to realize that Jesus was far more than just a good teacher—Jesus was something more. But it wasn’t until Tanul had time to ponder this Scripture that God washed his heart clean. 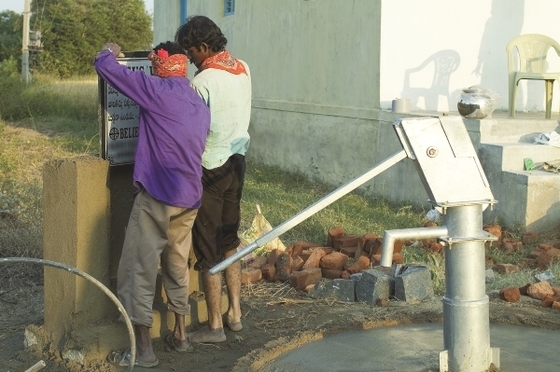 Tanul wasn’t the only one working at the new well that day—God did His work, too, and a spring of water welled up within Tanul’s own heart, just as the plaque said.